Our Pest & Wildlife Blog has updated information and news about local Pest Control, Wild Animal Removal and our experts that handle nuisance wildlife and structural pests every day. The Pest Control and Wildlife Management industries are rapidly evolving. Exterminators specialized in modern pest control practices and animal removal experts operating at one company was extremely rare just a few years back. Today the two industries are becoming more aligned and companies like Ultra Safe Pest Management are emerging as industry leaders in both Pest & Wildlife Management. Discover modern ways of pest control, animal removal, pest proofing and wildlife exclusion, and other long-term control method. Stay up to date on the latest trends, news and pest control innovations happening in Massachusetts and surround areas. We hope you enjoy our Pest & Wildlife Blog! Pest Control Services Ultra Safe has been providing Pest & Wildlife services for 15 years in the Canton – Boston areas. 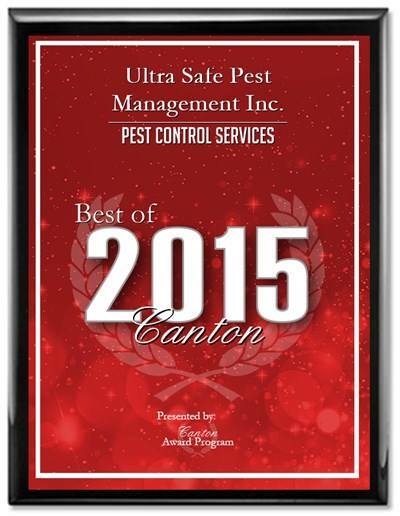 We are very happy to be awarded ‘best pest control company’ for 2015!